The Committee on State Building, Regional Policy and Local Self-Government recommended the Verkhovna Rada to adopt draft law No 8051 “On the Principles of the Administrative and Territorial Structure of Ukraine”, prepared by MinRegion, in the first reading. In the framework of the current Constitution, the draft law defines the principles for the administrative and territorial structure of Ukraine to be based upon, but does not change it. In particular, the draft law defines the notion of administrative and territorial structure, administrative and territorial units and their levels, settlements and their categories, and determines the procedure for the formation, liquidation, establishment and change of the borders of administrative and territorial units and settlements, etc. The draft law states that the system of administrative and territorial units remains three-tiered. It is envisaged that the rayon level should be more streamlined and comply with the European standards. The draft law more clearly defines the notion of “hromada” as an administrative and territorial unit of the basic level, consisting of one or several settlements and land outside their borders. As it is known, the issue of administrative and territorial structure is settled in Ukraine by the Procedure, approved in 1981 by the Decree of the Presidium of the Verkhovna Rada of the Ukrainian SSR. 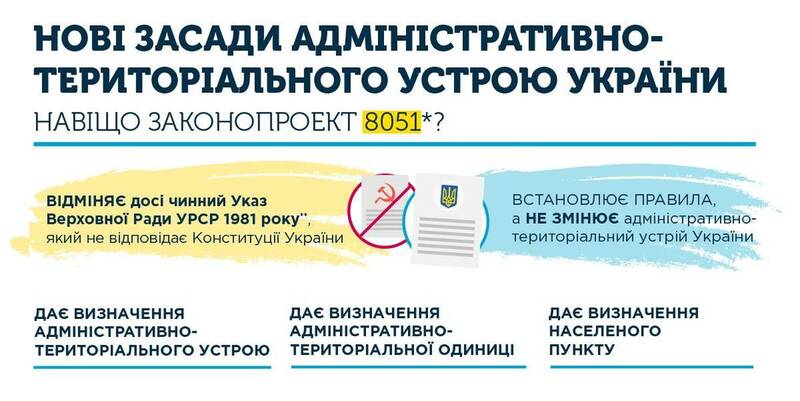 This document does not comply with the current Constitution of Ukraine.